Description: 21 acres of rolling land surrounding a church and its parking lots. Dual tees on most holes. The public is welcome; please respect the neighbors. Limited hours on Sunday due to services. Local Directions: I-5 N; Exit 297 (Terwilliger), left (west) on SW Terwilliger, left on SW Barbur Blvd., right on SW Bertha Blvd., left on SW Vermont St. 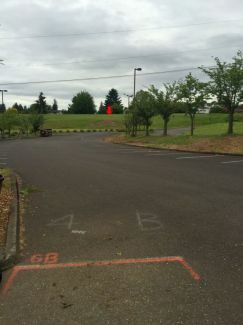 Follow signs to Greater Portland Bible Church and 1st tee. 2374 SW. Vermont St. Go through apartments and through church lots to 1st tee at top of parking lots next to dilapidated windmill.